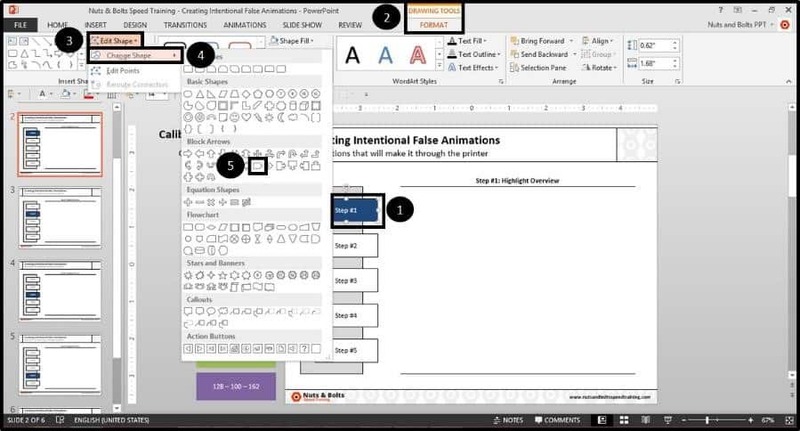 The best types of PowerPoint animations, are the intentional false kind that you build yourself! 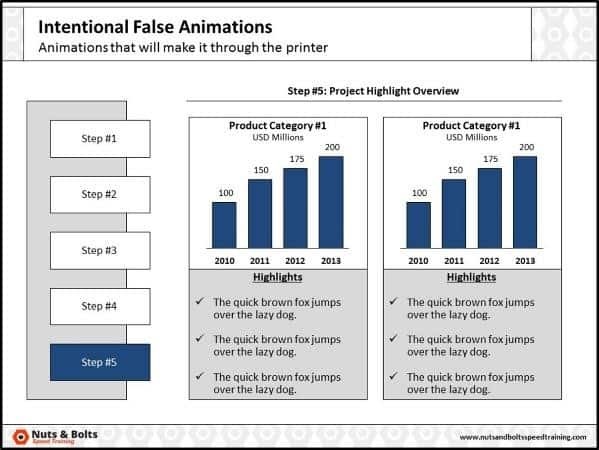 Most people have heard of and used animations in their presentations. 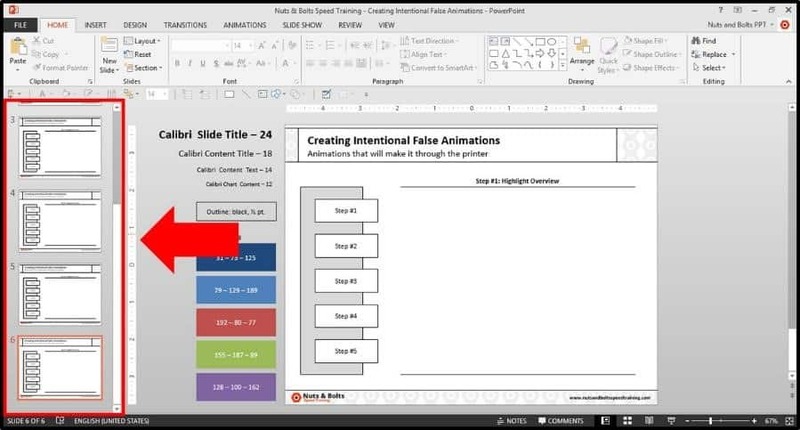 However, here at Nuts & Bolts Speed Training, we almost never use the ready-made PowerPoint animations found in the Insert tab. Why? Because animations don’t show up when you print your deck, and more often than not, they’re distracting. 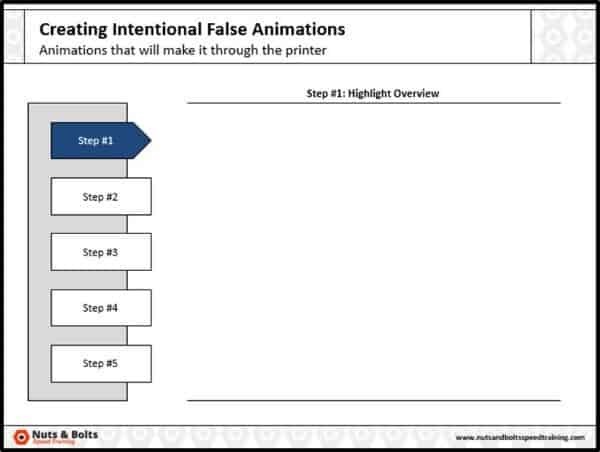 Instead, we like to use 'intentional false animations,’ which are simply animation-like effects that are created by altering one element in a series of slides…just like the flip books children like to play with. 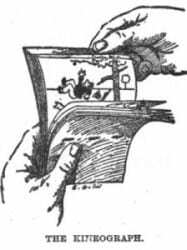 'Intentional False Animations' are like this flip book, or ‘kineograph,’ from 1886. 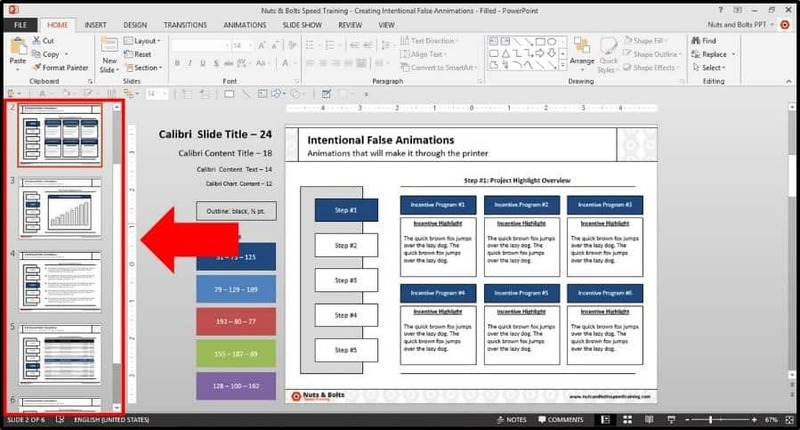 What are these types of false PowerPoint animations good for? 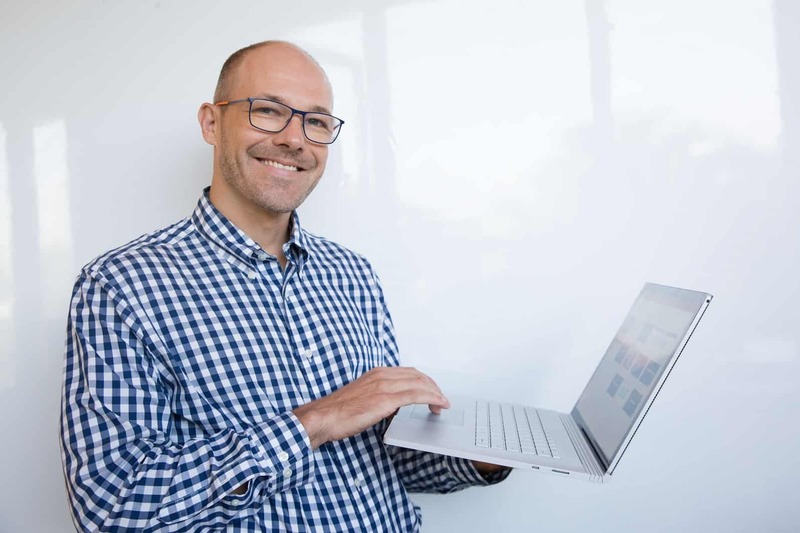 They are best used when walking someone through some series of steps, or processes in your presentation. Consultants use them frequently to structure their presentations as they create sign-posts along the way, to let someone know where they are in the scheme of things, which is important for really long presentations. 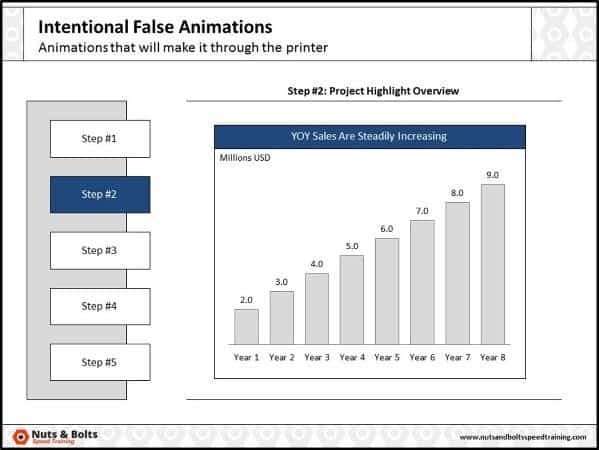 The other beauty of intentional false animations, is that besides being effective when presenting on overhead projectors, they are also the only type of animation that will survive a trip through the printer! 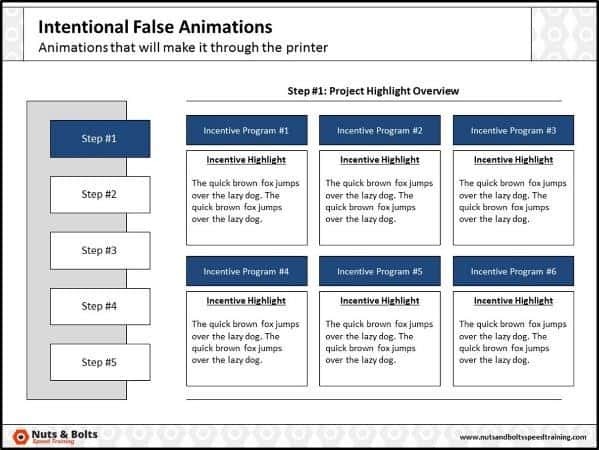 So if you are creating hard copy booklets for your presentation or client deliverable, intentional false animations will still come through crystal clear as they are not based on a graphics engine, you are simply alternative colors to create the animation like effect. 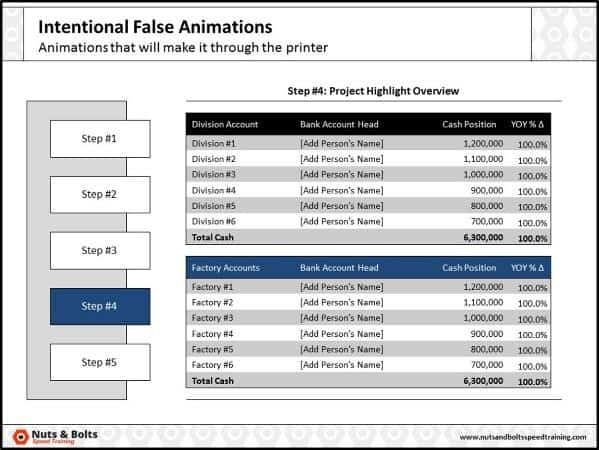 So you can print your slides and not worry about clients missing out on a key design element or point. 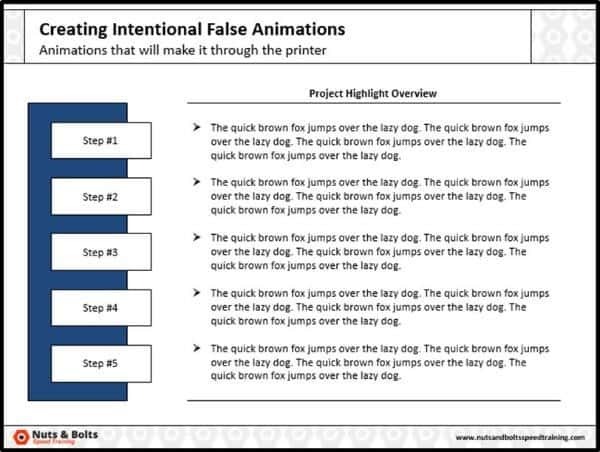 Below is both a video and written PowerPoint tutorial for how to create and use 'Intentional False Animations' in your presentations depending on which medium you like best! 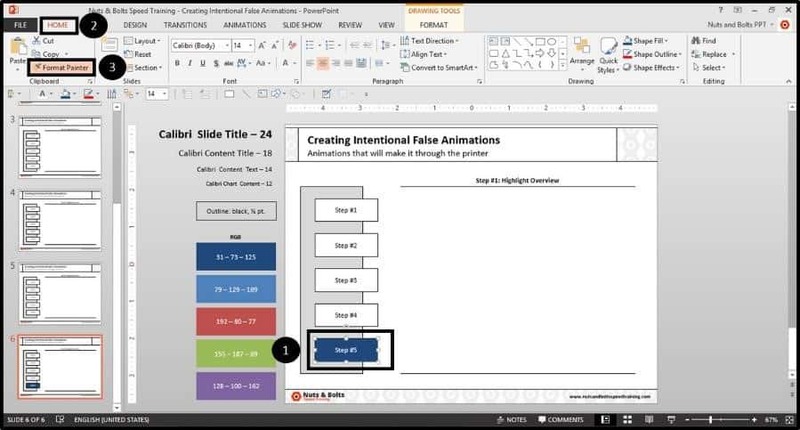 Watch the video below to see how you can quickly create and use ‘Intentional False Animations’ in your next PowerPoint presentation. Here's how to create the steps of a process for a client deliverable in PowerPoint, using 'Intentional False Animations'. 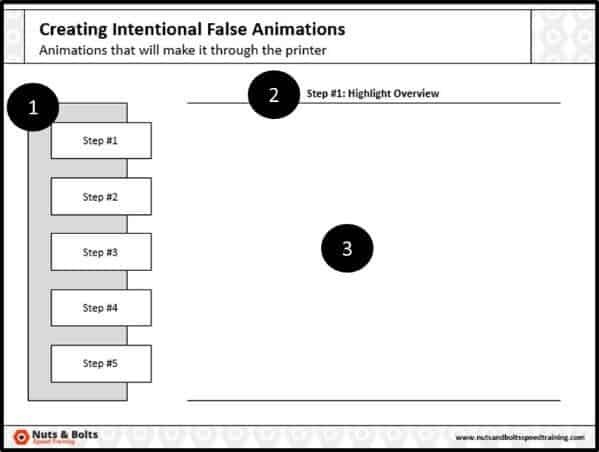 The most important step in creating an intentional false animation, is the first overview slide. In this case, I have the five steps of a process outlined down the left side of the slide that I want to walk someone through. 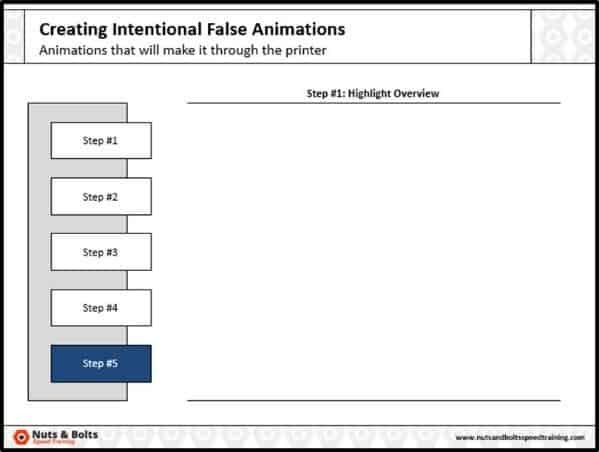 Note: Make sure everything is PERFECT on this first starting slide, before moving to Step #2 as you don’t want to fight your own formatting later on. With your starting slide set, hit CTRL + SHIFT + D on your keyboard for PC users to duplicate the slide. With your slide formatted with visual contrast, you then want to duplicate the slide for all of your other steps. In this case I hit CTRL + SHIFT + D for duplicate four times so that in total I have six slides within this presentation. 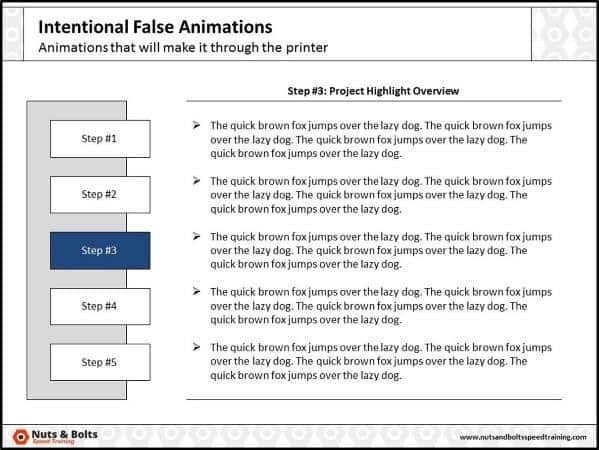 Here on the last slide within the process, format the last step (Step #5 in this case) to indicate that you are currently on that last step. I will fill format the last step with a dark blue fill color and change the font color to white. With your last step formatted, select the last step, and then from the home tab double click the Format Painter to lock it. Note: To lock the format painter (which is different than normally selecting it) you HAVE to click-click the Format Painter twice (click once, click twice). 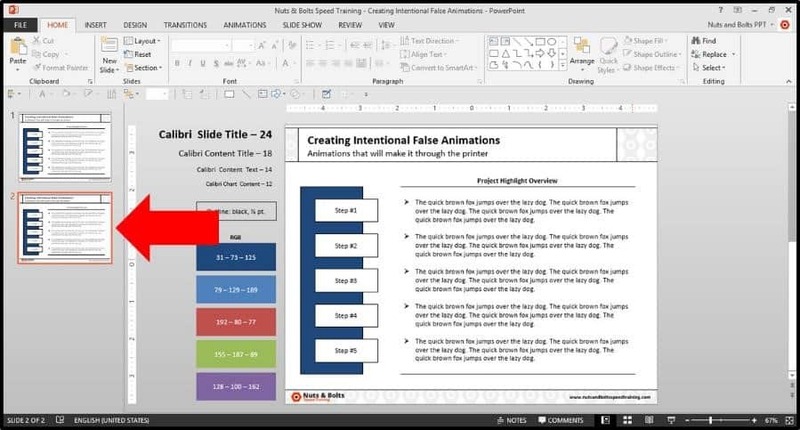 With the format painter locked, you then want to hit Page Up and apply that formatting to each of the other subsequent steps within your presentation (creating the flip book like effect). With the formatting applied, hit ESC on your keyboard to unlock the Format Painter. Note: Don’t forget you’ll also need to change all of the titles for all of your slides to match the steps. Besides creating an intentional false animation with just formatting, you can also change the shape of your objects to highlight them. For example, with the Step #1 rectangle on the left selected, I could navigate to the Drawing Tools Format tab, open the Edit Shape drop down, select Change Shape and then select a shape. Here I’ve selected the Pentagon PowerPoint shape. If you wanted to use a different shape like this, you would then want to cycle through your other slides and change the shape for each step to consistently highlight the steps of your process. With the false animation set within your presentation, you’ll then want to build out the rest of your slides, which I’ve mocked up in the picture below. Hit F5 for Slide Show Mode on your keyboard, and you can see the false animation as you flip through your deck (as you can see in the photo gallery below). 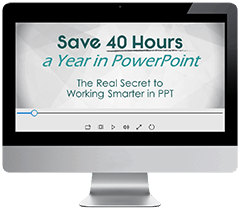 This is again a great trick for not only walking people through your presentation on an overhead projector, but doing so with hard copies of your presentation as this is the only type of PowerPoint animation that will survive a trip through the printer.